I'm back from Fogcon where I saw lots of folks I like, who I don't see that often. And I have a jade commission with stunning stones. I'll be putting up a photo of them later. 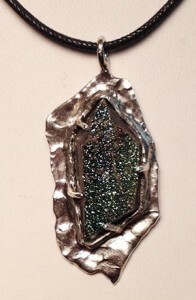 This photo is a calcopyrite (gorgeous) pendant set in sterling. Stone is far more brilliant then it photographs. It's almost sequin-like in multiple blues with a touch of gold. Design was made to both set off and reflect the stone. It's about 1.75"
This photo is a sagenite set in sterling. 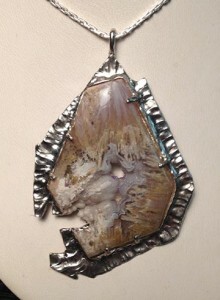 Sagenite was a new stone to me and this was a particulalry exceptional one chosen from several beauties. A very different texture and design for a very different stone. It's about 3". I'm pretty happy with this photograph. I love both of these designs and thought it was interesting to post them together.